Crystal is a Saginaw Valley State University graduate with a B.S. in Exercise Science and is also an ACSM certified Exercise Physiologist, NETA Group Fitness Instructor and NETA Wellness Coach. Crystal has been with Dow Midland Wellness Centers since 2015 where she started her career as an intern. She discovered her passion for health and fitness in her early college years and is driven to help and support others in learning how to incorporate healthy habits into their daily lifestyles. Crystal uses her knowledge of fitness and nutrition as well as personal experience to motivate and educate clients in reaching their goals. She is a strong supporter of living a healthy, balanced lifestyle between fitness, work, and a social life and strives to root this key to success into every client. Crystal believes fitness is a journey with no finish line and that it's never too late to become a better version of yourself! Sherry began her career at the YMCA in Findlay, Ohio in the mid 80’s. Since that time her career has grown as she worked in a variety of wellness environments including community-centered wellness, private, commercial, and finally corporate wellness. She obtained her first certification in 1988 as an American Council on Exercise Group Exercise Instructor and since has obtained various other certifications including the American College of Sports Medicine Certified Personal Trainer. She has worked in the corporate wellness environment in Midland for 22 years. Her passion for helping individuals lead healthier more active and productive lives is her driving force. Chris holds an Associate’s Degree as a Health Fitness Specialist from Delta College. She is a certified personal trainer from NSCA and an ACE group fitness instructor. She also holds a Nutrition Level 1 Certificate in Exercise Nutrition. After retiring from Dow, Chris decided she wanted a new adventure and headed back to school. During her journey to become a Physical Therapist, she discovered that she really enjoyed exercise instruction. 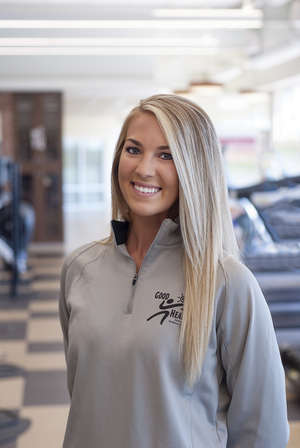 Even though she just recently started her new career in the fitness field, Chris has been an active member of the Dow Fitness Centers since they first opened. She enjoys working at the centers and loves applying all that she’s learned (including her physical therapy knowledge) to help people on their journey to become fit; as well as achieve additional recovery from (or prevent) physical injuries. As someone who has faced her own fitness and health challenges, Chris understands what people face every day trying to be their healthiest selves. She considers it a privilege to help individuals achieve their health and fitness goals. Amanda graduated from Saginaw Valley State University in 2013 with a Bachelor Degree in Exercise Science. She has been working at the Dow Wellness Centers since 2013 and has a real passion for the senior population. She is also the 50+ Program Coordinator at the Greater Midland Community Center. She loves working in these different roles because it gives her a chance to see so many different faces. She is passionate about helping others use exercise as a preventive care to health. She is a trained CDC Life Style Coach here at Dow and is also Group Exercise Certified and Wellness Coach Certified through NETA. Helping others drives her love for her job every day. Sarah has been with us since 2014. She has been around and involved in fitness most of her life. Sarah became interested in personal training while finishing her career playing collegiate basketball and track at Northwood University. She earned All-Conference honors in both sports and was named a National Strength and Conditioning All American. Sarah is a NETA certified Personal Trainer that loves teaching the benefits and proper technique for Olympic and compound lifts. She enjoys helping people reach their goals and feel better about themselves by educating them about the benefits of an active lifestyle and healthy eating habits. Megan has had experience in the fitness field since 2010. She was drawn to the field from her participation in basketball and softball in high school. Megan attended Saginaw Valley State University and graduated with a B.S. in Exercise Science and double minored in Athletic Coaching and Health Science. Megan is a ACSM Certified Personal Trainer, TRX Certified Group Exercise Trainer and a NETA Certified Wellness Coach. Megan has experience working with lots of clients ranging from youth to elder populations and from athletes to sedentary individuals. She prides herself on pushing others to the next level and bettering their lives through fitness. Megan strongly believes it is important to live a fun and healthy lifestyle by maintaining the motivation to continuously achieve your health and wellness goals! Jason has worked in the health and fitness field since 2000. Most of his career has been spent working with corporate fitness accounts. He worked as a Fitness Center Manager for Ford Motor Company for over four years and as a Wellness Specialist at the Dow Chemical Wellness Centers since 2005. Jason attended Central Michigan University and graduated with a Bachelor’s degree in Health and Fitness. Jason is also certified though the American College of Sports Medicine as a Health Fitness Specialist and the American Council on Exercise as a Group Fitness Instructor. He has extensive experience designing safe and effective exercise programs for individuals of all ages and fitness levels. Casey received her B.S. in Exercise Science from Saginaw Valley State University and is also a ACSM Certified Personal Trainer and a NETA Certifed Group Exercise Instructor. She has always enjoyed living an active lifestyle. She never realized how much she took this lifestyle for granted until she tore her ACL years back and needed to have surgery and go through the rehabilitation process. Casey pushed herself as hard as she could through the rehab process and got back to her lifestyle two months before the doctor expected. This experience is what pushed Casey to start a career in the health and wellness field and pursue a degree in Exercise Science. It showed her that anything is possible with hard work and determination and that’s something she loves to instill in people today. Casey enjoys motivating others in similar situations because she knows once they get over the barrier that is holding them back, anything is possible! Anna is a Saginaw Valley State University graduate with a B.S. in Exercise Science and is also an ACSM certified Personal Trainer, NETA Group Fitness Instructor and NETA Wellness Coach. Anna has been with Dow Midland Wellness Centers and Greater Midland since 2016. Her passion is learning how the body works to help others through all aspects of wellness. 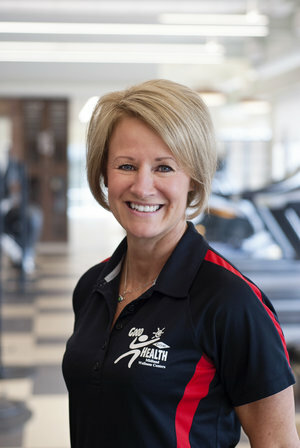 Since staring at Dow Midland Wellness Centers, Anna enjoys personal training and leading group exercise classes. She loves working with clients who are at a variety of fitness levels and goals; from moms looking to get back into the gym to clients hoping to lose weight and have greater enjoyment from daily living activities.